From previous 'Rant' posts it should be clear that this Roman Catholic no longer believes that the fellow they call Pope Francis can possibly be the vicar of Christ here on earth. (For this reason I may often refer to him as 'Señor Bergoglio', his proper name.) But how have we arrived at this point - where we have no Pope, or where the Pope is not Catholic? One idea, popularly called Sedevacantism, theorizes that since Vatican II, the heresy of modernism has infected the Church and has rendered all recent conclaves invalid so that we haven't had a true Pope in 50 or 60 years. Thus the term 'sede vacant', which means the chair (of Peter) is vacant. Moreover, most sedevacantists assert that recent (within the past 50 years or so) episcopal consecrations, priestly ordinations, and the Novus Ordo Mass may all be materially invalid. That is to say, they've been materially changed (by accepting non-Catholics into the Council, changing essential liturgical words, etc.) and therefore lack validity. In sacramental theology this would be somewhat analogous to, for example, wanting to baptize without pouring water or without saying the correct words of baptism. There would be no Baptism, regardless of one's good intentions. The sedevacantist solution to the crisis would be a general repudiation of Vatican II and a new valid conclave. Another less extreme theory, called Sedeprivationism, maintains that recent popes have been validly elected and so are materially eligible to reign. But, by accepting the heresies of Vatican II, especially modernism, all the Novus Ordo Popes - Paul VI through Francis - have failed to accept the true authority of the Chair of Peter, and so are not true popes. The now infamous quote by Bergoglio "Who am I to judge?" was, in effect, his explicit denial of pastoral authority. If he doesn't think he has apostolic authority, he in fact doesn't have it. This would be somewhat analogous to baptizing with water, but without really intending to baptize. There would again be no Baptism. According to Sedeprivationism, should Francis (or any particular Novus Ordo bishop or priest) formally and publicly repudiate the errors of Vatican II, and accept the mantle of authority to teach Catholic Truth, the formal obstacle would be removed and he would immediately be bestowed with apostolic authority and become a true pastor, no new conclave necessary. The above simplified explanations are far from exhaustive. Fine distinctions, variations on the above themes, and other different ideas abound. There seems to be no clearly defined 'creed' to which all sedevacantists (or sedeprivationists, etc) adhere. Which is to say, there is almost as much variability and confusion in these camps as in mainstream Catholicism. There does remain at least one other way of looking at this riddle, a way that doesn't rely upon a legalistic analysis of the sacramental system, nor does it involve placing all the blame upon the Vatican Council or upon a particular heresy. This explanation is not a variation of any of the popular ideas such as sedevacantism or sedeprivationism, but looks at things from a completely different angle. The main problem is that it is not at all well known. In fact, I know of only one old retired geezer who is putting this alternate theory forward, and he's not a bishop or theologian or even a priest, so how credible can his theory be? Nevertheless, since yours truly is that old geezer, I will try to put this possible explanation on the table for your review, probably in the next blog post. 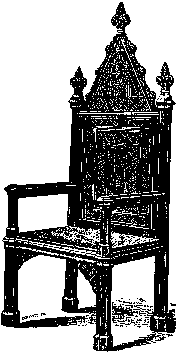 I kinda like that straightback chair / throne. Looks solid and dignified but not too ostentatious, Anyway, it's just a piece of clip art i already had on my hard disk. As for the next blog post, here's a hint - will probably entitle it "Until". i thank God that i am Roman Catholic. Jesus even said to Peter, get behind me Satan and Peter was speaking of worldly matters which might deter Jesus from his mission in saving us, His Cross. i try to remain affixed to that Old Rugged Cross; holding your hand. Glad we have the Nicene Creed. I've found references to Pope Pius X condemning modernism and requiring an oath, but haven't been able to find anything about John-Paul II doing so. Do you have a website or something to confirm your statement? (1) God cannot be known and proved to exist by natural reason;(2) external signs of revelation, such as miracles and prophecies, do not prove the divine origin of the Christian religion and are not suited to the intellect of modern man; (3) Christ did not found a Church; (4) and the essential structure of the Church can change; (5) the Church's dogmas continually evolve over time so that they can change from meaning one thing to meaning another; (6) faith is a blind religious feeling that wells up from the subconscious under the impulse of a heart and a will trained to morality, not a real assent of the intellect to divine truth learned by hearing it from an external source. From that definition, it is clear that Jorge Bergoglio is a modernist, but i am not. The oath against modernism was required of "all clergy, pastors, confessors, preachers, religious superiors, and professors in philosophical-theological seminaries" of the Catholic Church from 1910 until 1967. It was instituted on 1 September 1910 by Pope Pius X in his motu proprio Sacrorum antistitum and rescinded on 17 July 1967 by the Congregation for the Doctrine of the Faith with the approval of Paul VI. That page also gives an excellent excerpt from the actual oath. The First Things website also promotes modernist views, albeit from an ostensibly Catholic perspective. Read the article you've cited. There is no mention of John-Paul or anyone reinstating the oath. In fact, the article claims that both John-Paul II and Bendict XVI were modernists (which the author approves), and Francis is anti-modernist (which he laments)! The only part that now makes me hesitate is where it says that the truth will always be found "in the succession of the episcopacy". But i fear the episcopacy itself is defecting from the truth; that is my main lament. Does this make me a modernist?